81% of US households use slow cookers. From the New York Times bestselling author of the most popular slow-cooker series of all time, with 12 million copies sold. 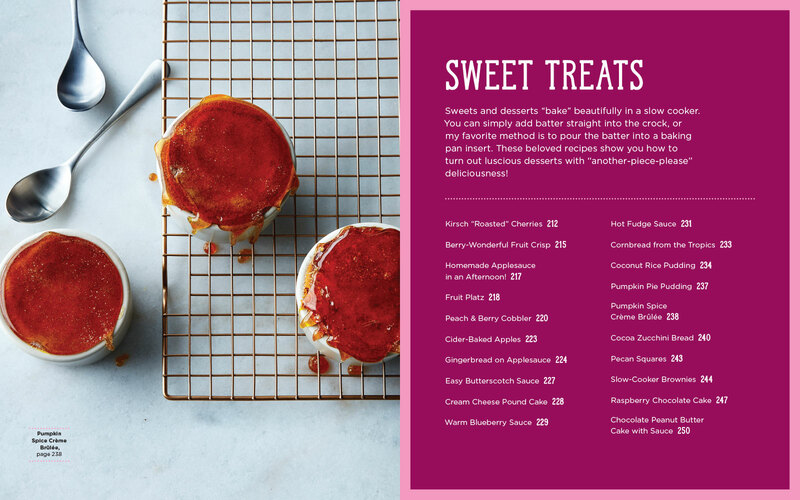 Easy-to-navigate with a beautiful food photo for nearly every recipe. Includes a complete slow-cooker guide that new cooks will appreciate. The mega-bestselling author of the iconic Fix-It and Forget-It cookbook series offers the ultimate resource for a new generation of slow cooker fans. 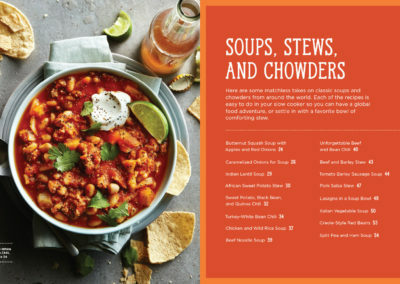 Stock the Crock is a fresh collection of the 100 essential slow-cooker recipes, updated for today’s cook, with better-for-you ingredients and bold flavors that are much preferred now. There are a dizzying number of slow-cooker recipes available everywhere these days. But which are the best ones? Phyllis Good, the recognized slow-cooking expert, brings together the 100 must-have slow cooker recipes, the ones that are utterly delicious, convenient, and reliable. Finally, here are the best recipes for every occasion and craving. 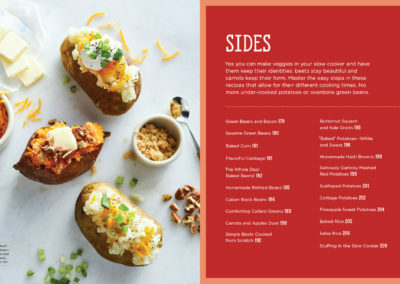 Included are classic favorites like Sweet-with-Heat Beef Short Ribs and Shepherd’s Pie, as well as creative of-the-moment recipes such as Cilantro Lime Chicken Tacos and Raspberry Chocolate Cake. 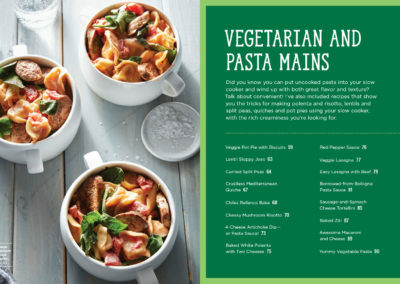 Each dish includes Variations to tailor it for Gluten-Free, Vegan, Vegetarian, or Paleo diets. Many recipes can also be adjusted to be more Kid-Friendly or Made for Two. This easy-to-use, but authoritative reference will help readers get the most out of their slow cookers. And the gorgeous photographs and foolproof recipes will inspire them to create deeply satisfying meals every day of the week. 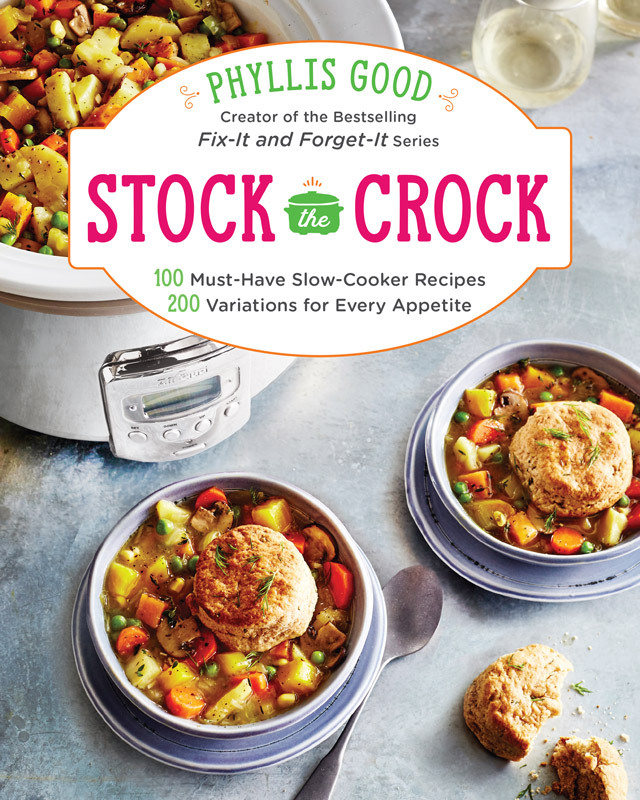 To order your copy of Stock the Crock: 100 Must-Have Slow Cooker Recipes with 200 Variations for Every Appetite, click on one of the following links. There are seven main sections in Stock the Crock. Click on any of the spreads (section indexes) below, and they will enlarge. Phyllis Good is a New York Times bestselling author whose books have sold more than 12 million copies. 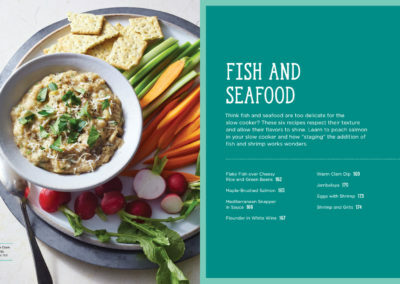 In addition to The New York Times bestseller list, several of her Fix-It and Forget-It slow-cooker series of cookbooks have appeared on the bestseller lists of USA Today and Publishers Weekly. Good’s commitment is to make it possible for everyone to cook who would like to, even if they have too little time or too little confidence. Good, who holds an M.A. in English from New York University, has authored many additional cookbooks. 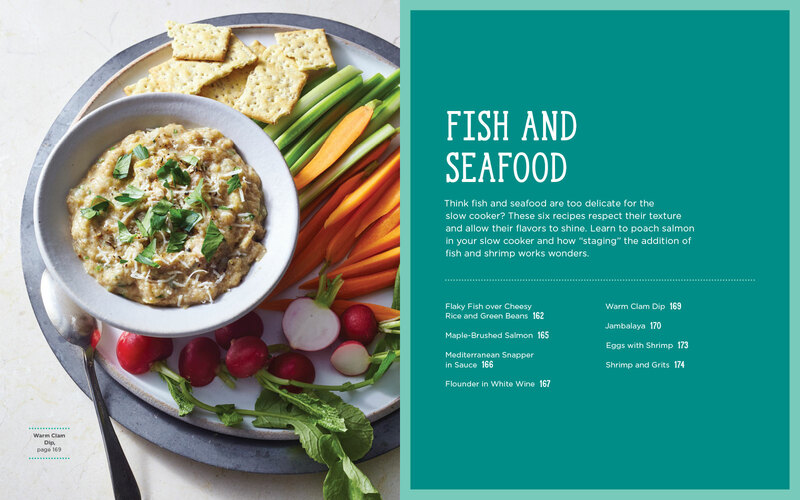 Among them are Fix-It and Enjoy-It Healthy Cookbook (with nutritional expertise from Mayo Clinic), The Best of Amish Cooking, and “Fresh from Central Market” Cookbook. She spends her time writing, editing books, and cooking new recipes. She and her husband, Merle, are the parents of two adult daughters and delight in their two little grandsons. What distinguishes this book from my earlier slow-cooker books? 1. First a little background. When I brought out my first slow-cooker cookbooks, there were very few slow-cooker recipes available. So I packed those early books with 600 to 800 recipes, and people loved all of the variety and choices. But things have changed. There’s a flood of slow-cooker recipes everywhere you turn these days. Now the question has become, okay, but which are the best recipes? Which ones are reliable and will turn out “make-it-again” results? Beloved classics, with clear, easy-to-follow instructions about how to make them their optimum best. And recipes with new flavors and fresh ingredients—dishes that you didn’t know you could do successfully in a slow cooker. I have come up with the 100 slow cooker recipes you cannot live without so you don’t need to stew and fuss over which of the multitude of available recipes might be the best. 2. 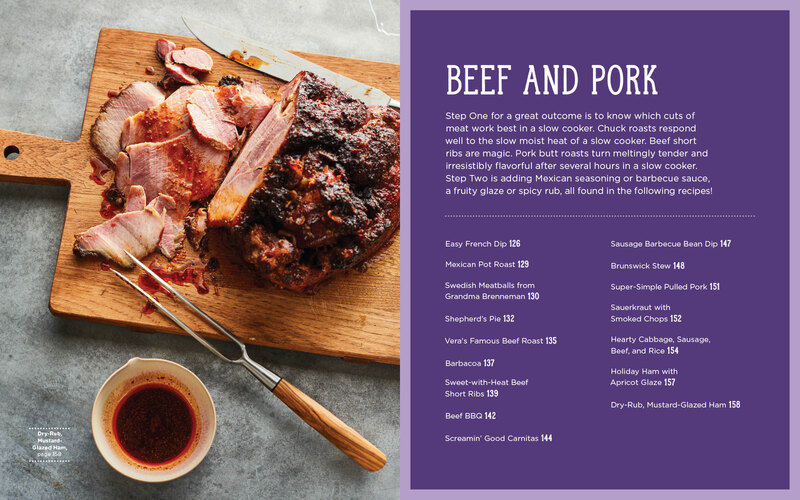 Second, Stock the Crock offers more than 200 recipe Variations so you can customize these recipes to fit the dietary preferences and needs of the people who eat at your table. Looking for a gluten-free dish, or one that’s Paleo-friendly? 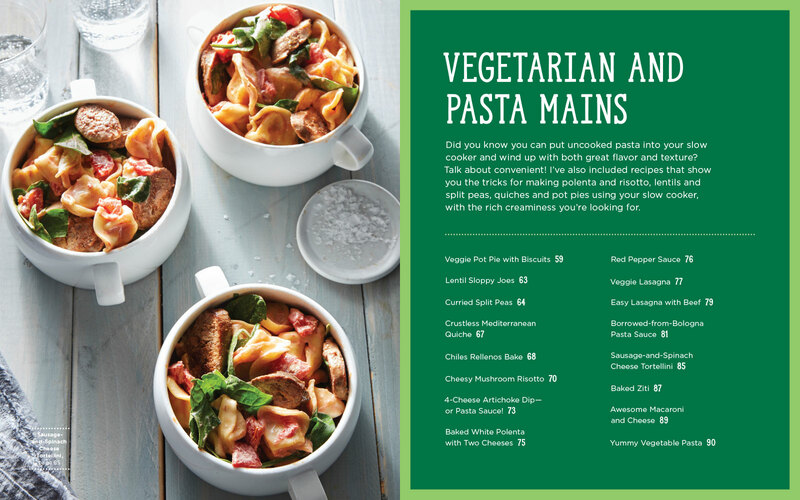 Or one you can serve to your vegan or vegetarian friends? Are you feeding a cautious eater? Would you like to make a dish just for two? Or do you need a quick-and-easy method? Stock the Crock has a separate Index for each of these dietary preferences and cooking approaches so you can quickly flip to the recipes that fit your need. You don’t have to buy a separate cookbook for these particular dietary restrictions, nor do you need to search the web. They’re all here in one beautiful package. 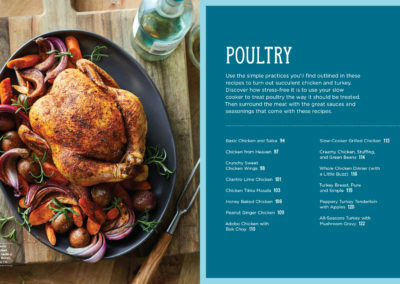 Which reminds me of a third distinguishing feature of this book—a clean and bright color photo accompanies nearly every recipe. 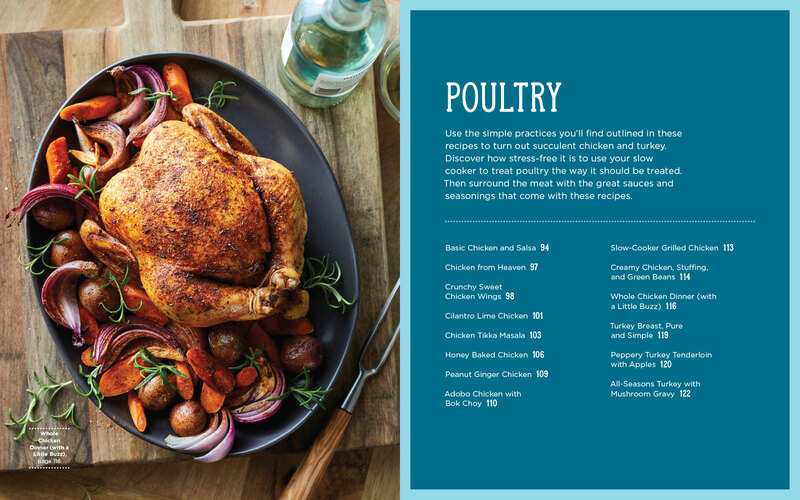 So in summary, Stock the Crock features 100 selected, flavorful (both classic and fresh) recipes, with Variations so you can alter the recipes to feed everyone who comes to your table! 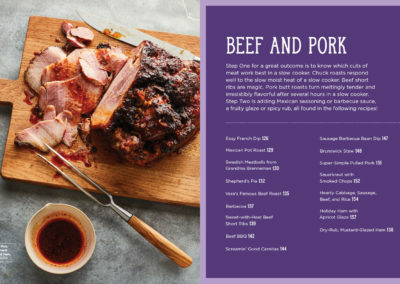 What are some of the key features of this new cookbook? The 100 curated best of the best slow-cooker recipes. 200 Variations so you can adapt these recipes to make them Gluten-Free, Paleo-Friendly, Vegetarian, or Vegan. Or adjust the recipes so they please Picky Eaters or are Made for Two. Includes surprising new techniques and slow-cooker hacks, such as “staging” your recipe to ensure bright, fresh vegetables and flavors in the end; cooking 2 recipes at once using the same cooker; easy make-ahead tricks; and baking tips to make the most of this convenient appliance. An irresistible photo of nearly every recipe will inspire you—and demonstrate how easily you can create slow-cooker dishes using fresh ingredients. Of great appeal both to fans of Phyllis’ earlier Fix-It and Forget-It titles, as well as the new generation of slow-cooker fans. The title, while still championing the benefits of cooking with a Crock-Pot, offers variations for the way people eat today, from gluten-free to vegan. With this in mind, Stock the Crock features 100 “must-have” recipes with 200 variations every type of eater. 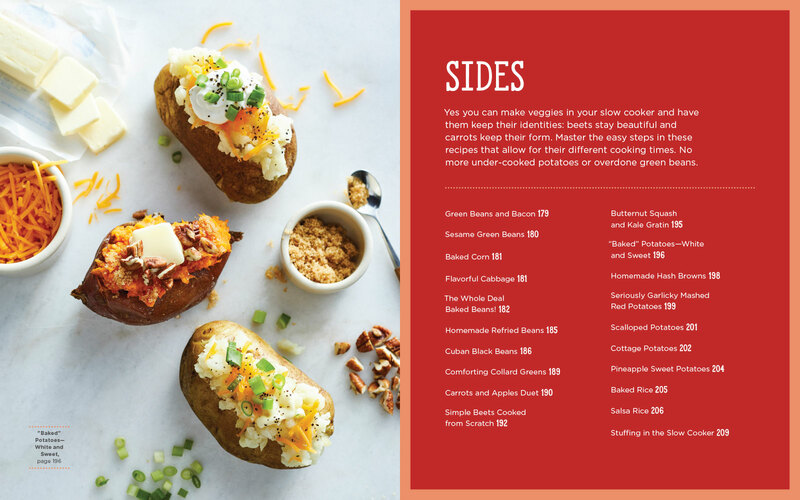 The recipes in the book therefore offer suggestions for swapping ingredients and tips on making dishes gluten-free, vegan, vegetarian, Paleo-friendly, and less spicy. 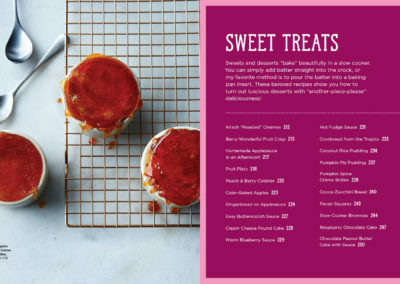 In addition to an index by main ingredient, a separate index helps readers find the 90 out of 100 recipes that are gluten-free; the 60 that are vegetarian and/or vegan; and the 41 that are Paleo-friendly. Hearty, flavorful and satisfying, these set-it-and-forget-it recipes are perfect for warming up chilly fall nights — and guaranteed to please! 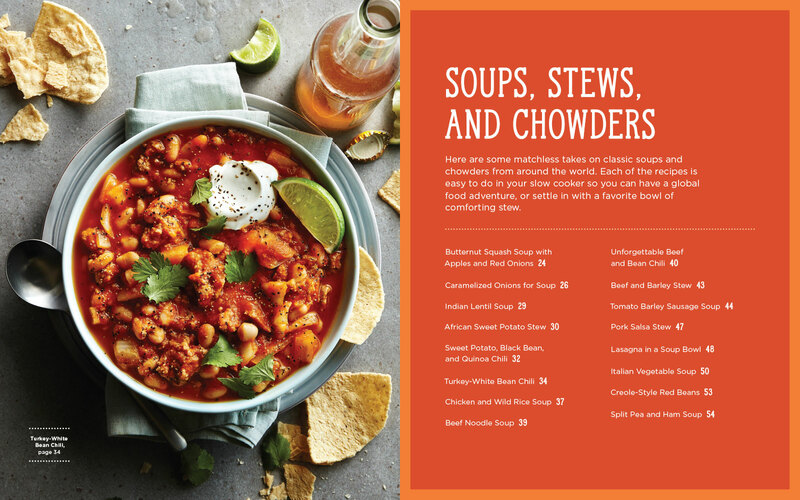 We were thrilled to discover the new cookbook Stock the Crock, which is filled with 100 tried-and-true slow cooker recipes for classic fall favorites that virtually cook themselves. 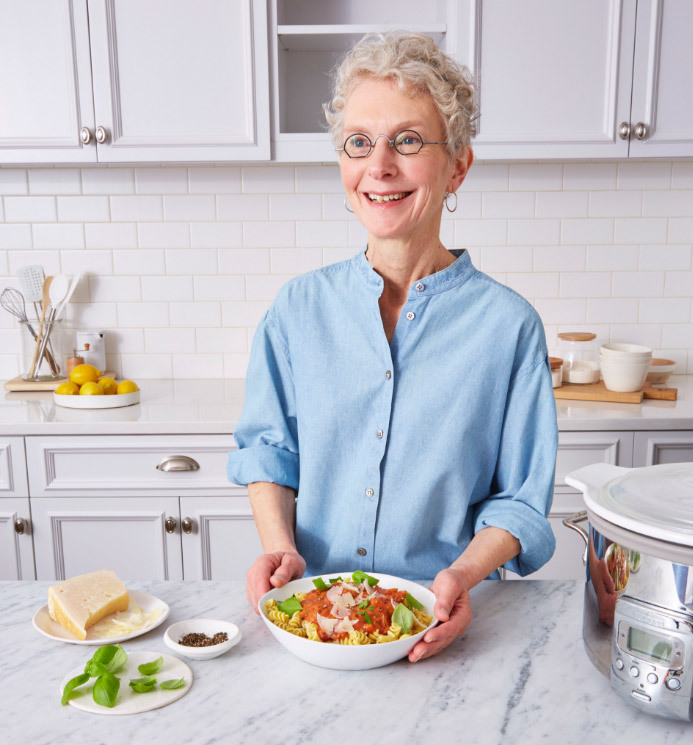 “I looked for the recipes that no slow cooker user should be without—the ones that guarantee make-it-again results,” says author Phyllis Good. Taste the goodness with one of these delights tonight! 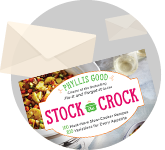 Enter your email and receive exclusive recipes, slow cooker tips and tricks, and a glimpse behind-the-scenes at Stock the Crock.